On the eve of my daughter’s first birthday, my husband and I made the tough decision to leave San Francisco. It was the place we had called home for the previous seven years and where we had made many unforgettable memories. We were sad to leave the community of friends we had built, the rich diversity of ideas that flourish in the city, and the thriving tech industry we contributed to on a daily basis. As hard as it was, we felt it was time to prioritize family and start a new chapter in our lives. With our eyes set on returning to our home state of Texas to be closer to family and on lightening the constant financial pressures of the Bay Area, we started packing. As we were deciding how many bags of Philz Coffee beans could fit on our moving truck, serendipity struck. I was contacted by a company called InVision who was looking for a leader to help build out their people team. It looked like an interesting company, but I figured I would have to pass on the opportunity since we were in the process of relocating to Austin. I assumed that they were SF or NY-based as many hyper-growth tech companies are. I soon learned that InVision focuses on hiring the best person for each role, regardless of location. Their workforce is 100% distributed. What?!? A fantastic opportunity at a hyper-growth, well-respected company that fits my life plan? Yes, please! Fast forward a year and a half, I’m hooked on the remote working lifestyle and I cannot imagine working any other way. It’s a powerful combination when your job enables you to live the life you always wanted and didn’t think existed. What I’ve found is that it’s not so much about work-life balance, but work-life integration. While putting in a full day’s work, the remote life allows me extra time for personal wellness, my own hobbies, as well as time with my family and friends. InVision encourages me to find balance amongst the drivers of my satisfaction in order to live a healthy and fulfilling life. With such work-life integration, all of life’s demands are able to intermix together more seamlessly. The washing machine company can give me a four-hour delivery window and it doesn’t disrupt my life because I’ll be home whenever they’re able to arrive. With the time saved not commuting, I can squeeze in a spin class, happy hour with friends, or an evening visit to the playground before bedtime. I truly believe that InVision is building the company of the future. We are able to scour the Earth for the very best talent and reduce our dependence on competing for talent in the major tech hubs. We have incredible designers, engineers, and others, totaling 650+ employees in 40+ states across the United States and in more than 25 countries around the world. My story is not unique. There are many other InVisioners who were working for a tech company in San Francisco or New York but wanted a different lifestyle. One of the members of my team had been living in the Bay Area for 10+ years but was yearning for the quieter life and open roads of Oregon. Since joining InVision, he’s been able to accomplish what he once thought was an unattainable goal — work for an incredible company while spending time on his family farm. Another member of my team had a life goal of home ownership and a wish to spend more time with her aging father in Phoenix. She has since been able to relocate there and purchase her first home! I could go on and on, but I think you get the picture. Joining a fully distributed company is changing people’s lives. And even if folks aren’t interested in moving, InVision enables them to visit and work remotely from places they’ve always wanted to see or spend time with a loved one in need, with little to no disruption to their work life. One employee found out her mother was diagnosed with cancer. In most companies, helping her mother who lives in another state during this difficult time would mean taking an unpaid leave of absence or worst case, leaving her job. With our distributed model at InVision, she was able to work remotely from her hometown and take her mother to every one of her chemo treatments. One counter-intuitive observation I’ve had about relationships at InVision is that I actually feel closer to my coworkers, some of whom I’ve never met in person, than I did for years when working in a traditional office setting. 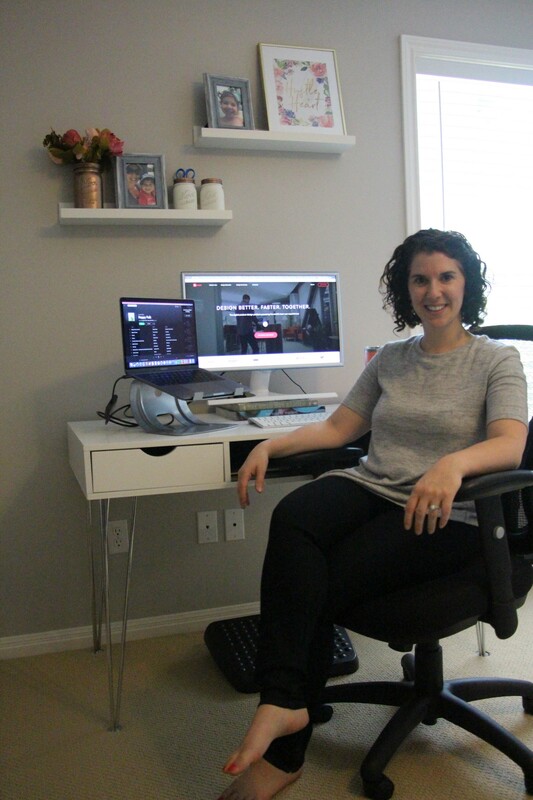 When working from your home office you’re welcoming coworkers into your home via video conferencing and can be more of your whole, relaxed self. I noticed that teammates get insight into my actual life, not the “persona” I present in the office. This more organically provides opportunities to share stories about who I am outside of the office — the concert poster on the wall, the toddler saying hello after getting home from daycare, or to have a quick laugh when I’m yelling over the sound of the lawnmower outside my window. We believe that distributed workforces may be the answer to many of the challenges currently facing the tech industry. This includes, but is not limited to, work-life balance, encouraging women to build careers in the tech industry, avoiding toxic workplaces and building diversity of thought. We have over four million customers globally. The fact that we have InVisioners across the world helps ensure we have greater empathy for our customers and truly understand their needs, which also enables us to build a better product. While being a completely distributed company presents a unique set of challenges from a people perspective, we are creating a set of best practices that we think could be a blueprint for the industry. One of our strategies is to break through the two-dimensional barrier of the screen with high emotional intelligence. We specifically hire for empathy and humility. People at InVision need to be capable of connecting at a human level. This requires greater emotional intelligence than the average organization typically warrants and a willingness to build relationships around the virtual water cooler, in one-to-one conversations, and team meetings. InVision is a thought leader in digital product design and design thinking concepts. That mindset reverberates throughout our entire organization. We run the People team like a product team and utilize design thinking principles when developing our people processes and the technology we use. We care deeply about the employees we support around the globe and take a human-centered approach when designing employee experiences. Sapling — An employee onboarding tool that provides clear, transparent and consistent guidance to the many new hires joining the company each month and smoothly integrates with our applicant tracking system and other HR systems. Zugata — A performance and continuous feedback tool that uses cutting-edge machine learning to proactively request feedback from your peers on a weekly basis and delivers personalized development resources to employees. It also provides guidance to managers on how to deliver thoughtful developmental feedback. Bonusly — Peer recognition software that integrates with Slack. This way, all of the great work being done across the company is shared with the organization which creates transparency and empathy across departments. This experience has taught me that building the company of the future requires building the People team of the future. Through our use of cutting-edge technology platforms, we can address employee needs across the globe in progressive ways. The core tenets of our People team include globalization, scalability, process improvement, and ultimately, designing for incredible employee experiences. These tools allow us to gain actionable feedback on our people product design and delivery. This magnifies the impact we are able to create and allows us to iterate quickly. Being at InVision has also taught me that work-life integration is achievable if a company’s culture truly embraces it. While the fully distributed model may not make sense for every organization, I hope some lessons we’ve learned can be applied to yours. Long story short — I feel lucky to be doing the best work of my career while having the time and space for myself and my family to thrive. Shelby is the Vice President of People Operations at InVision, the Digital Product Design platform powering the world’s best user experiences. InVision is the cornerstone of the product design process for more than 4 million people, including 80% of the Fortune 100 and brands like Airbnb, Amazon, HBO, Netflix, Nike, Slack, Starbucks, and Uber. Throughout her career, she has helped build and scale the people function at growing companies while creating world-class company cultures. Prior to InVision, Shelby ran the HR teams at Instacart, One Medical, and Palantir. If interested in learning more about opportunities at InVision, check out our website.